This section describes the application process for authority to translocate live aquatic organisms in Victoria. A summary of the process is provided as Figure 1. Translocation applications will be assessed against information provided on an application form approved by VFA. The translocation application provides information necessary to assess the proposed translocation. meets the requirements for a full risk assessment. If an application is not complete or provides insufficient information, the applicant is notified by the Administration Officer of application shortcomings and invited to resubmit the application. Where a proposed translocation application is assessed by the Administration Officer to be inconsistent with an approved translocation protocol or the principles and criteria for low-risk translocations, the TEP will provide advice to VFA that the application does not conform to the above. Where the translocation proposal is consistent with an approved translocation protocol or criteria for low-risk translocations, the application will be referred to the CEO, VFA or delegate. Where the proposed translocation requires a full risk assessment of the environmental risks, the TEP will assess the application and provide advice to the CEO, VFA, or delegate on the management of the translocation risks. The applicant will be notified of the decision in writing, including any relevant conditions. The risk assessment is based on the principles and information included in Appendix B. The use of quantitative data is preferable but qualitative data may be used in support of an application where quantitative data is limited or not available. Some translocation applications may warrant directed research to generate quantitative data for the assessment. 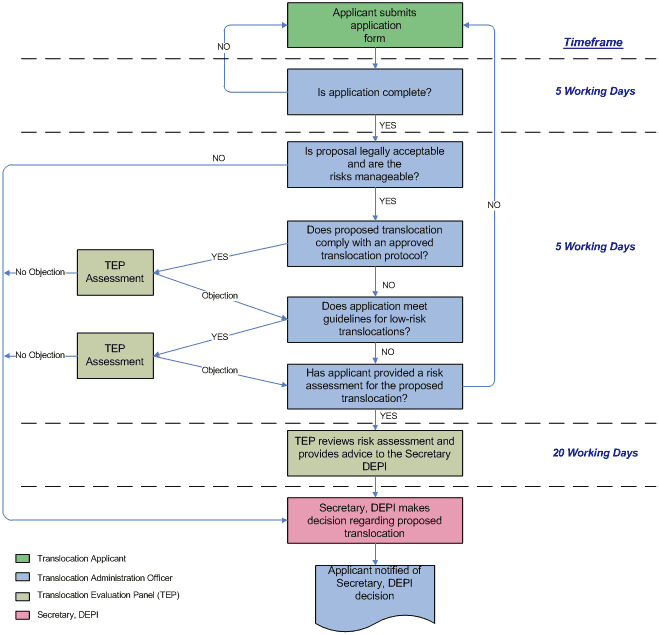 When directed research is required, the TEP will recommend that the translocation application is rejected until the applicant can provide the information. The risk assessment will identify parties responsible for risk minimisation and management strategies. Subject to legislation and policy, public notification may be required if in the public interest. Where a cross-border translocation is proposed or cross-jurisdictional issues exist, inter-agency consultation may be required. To be considered by the TEP, an application that includes a risk assessment must be received at least 10 working days prior to its next meeting. The TEP will provide advice including any suggested risk management strategies to VFA within 20 working days of the meeting at which the risk assessment is considered. The CEO, VFA, or delegate will consider the advice of the TEP before making a decision on the application. VFA will notify the translocation applicant of the decision in writing, including any relevant conditions. Once a translocation is approved, case-by-case assessment of subsequent translocation events is not required provided the translocation applicant can demonstrate conformance with the approved translocation.